Les Paul, Karl Farr, Ken Carson, Herb Kratoska, Curley Hoag, etc. 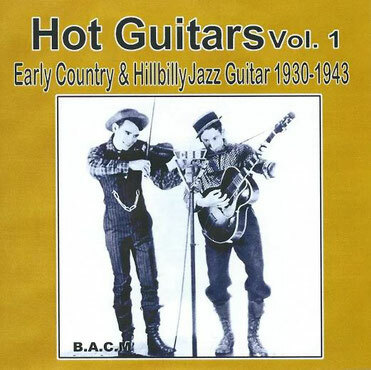 The sub-title of this 34 song anthology is Early Country & Hillbilly Jazz Guitar 1930-1943. While much of it may be perceived as “rustic,” you’ll find pioneering guitar styles that helped set the standards for rural jazz guitar. The tracks are not the genre’s first recorded work, but the two blues cuts from 1930, by Jack Cawley’s Oklahoma Ridge Runners, recall a style found on early Western swing that would come into prominence a few years later. Some of the artists, e.g. Karl Farr, who, with Curley Hoag, backs Gene Autry on two songs, “As Long as I’ve Got My Horse” and “Dude Ranch Cowhands” in 1938, had no need to “evolve.” Les Paul would become a legend in smooth jazz and popular guitar, selling millions of records. Here, he’s featured with his Les Paul Trio from 1939, and the basic elements of his very recognizable style come out clearly on these early records, although he plays acoustic guitar on these sides. His trio’s smooth vocalist was Chet Atkins’ half-brother, Jimmy. Paul’s mentor, Joe Wolverton, solos on 8 tracks, a real treat for Les Paul fans, and the very talented Herb Kratoska is featured with the Texas Rangers on 5 tracks. Harold Maus plays on a couple of early tracks. Maus was a member of the Novelty Aces, a group that, among other things, worked on a radio show hosted by Ken Curtis the year before Curtis joined the Sons of the Pioneers. And Ken “Shorty” Carson plays lead guitar with Shug Fisher on a tune from 1934 titled, “Shorty & Shug’s Guitar Blues.” There’s much more, and Kevin Coffey’s detailed liner notes offer valuable insight on the featured artists. Contact VenerableMusic.com, phone (678) 232- 0268.phone (678) 232- 0268.